The original version of this article, by Elizabeth Grossman, appeared on Yale Environment 360. In early 2010, while working in the impoverished rural region of Zamfara in northwestern Nigeria, the group Médecins Sans Frontières – Doctors Without Borders – encountered many young children suffering from fevers, seizures, and convulsions. An unusually high number of very young children, many under age five, were dying, and there were many fresh graves. The doctors initially suspected malaria, meningitis, or typhoid, all common in the region. But when the sick children didn’t respond to anti-malarial drugs or other antibiotics, one of the physicians began to wonder if local mining activity might be implicated. Historically an agricultural area, Zamfara had been experiencing a small-scale gold rush, thanks to rapidly rising gold prices that encouraged the pursuit of even the most marginal sources of ore. Mining work was taking place in and around the villages and within many of the mud-walled compounds where families were using flour mills to pulverize lead-laden rocks to extract gold. Médecins Sans Frontières (MSF) doctors sent children’s blood samples for testing and the results revealed acute lead poisoning. Many of the children had blood lead levels dozens, even hundreds, of times higher than international safety standards. Within a week, an emergency medical and environmental remediation team arrived and began to grapple with an epidemic of childhood lead poisoning that is being called unprecedented in modern times. In the past two years, more than 400 children have died in Zamfara, more than 2,000 have been treated with chelation therapy, and thousands more have been – and continue to be – severely poisoned by exposure to pervasive lead dust. 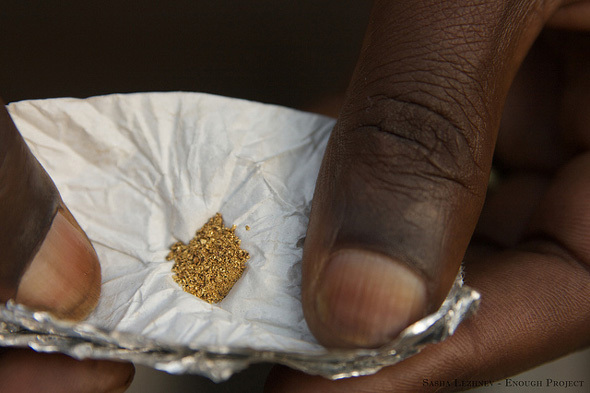 Photo Credit: “Conflict minerals 1,” courtesy of the ENOUGH Project/Sasha Lezhnev.